Determine the number of possible typosquat permutations. To configure the Bloom filter you need to specify roughly how many elements are going into the Bloom filter and what kind of false positive probability you want. You can use the CONSOLE output mode of the flatfile_summarizer.sh to count the number of typosquatted domains across the entire document. "state" : "state + LENGTH( DOMAIN_TYPOSQUAT( domain ))"
Indicates the schema of the CSV. There are two columns, rank at the first position and domain at the second position. Use a comma to separate the columns. For each row, transform each domain column by removing the TLD. Initialize the state, a long integer, to 0. For each row in the CSV, update the state, which is the running partial sum, with the number of typosquatted domains for the domain. For each thread, we have a partial sum, we want to merge the partial sums into the total. Generate the Bloom filter on HDFS. "state" : "REDUCE( DOMAIN_TYPOSQUAT( domain ), (s, x) -> BLOOM_ADD(s, x), state)"
Merge the bloom filters generated per thread into a final, single bloom filter to be written. 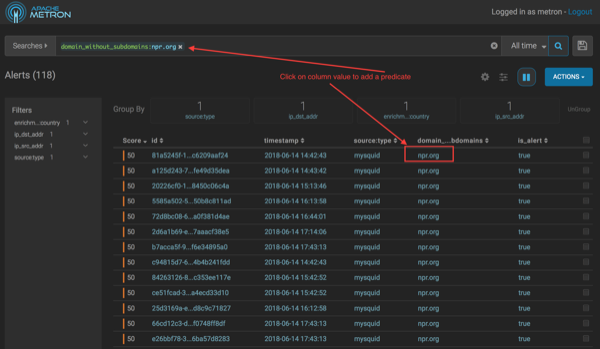 Apply your new filter to domains from the squid telemetry. Select the Squid sensor from the list of sensors on the main window. Click the pencil icon in the list of tool icons for the sensor. The Management UI displays the Squid sensor panel. Click (expand window) next to the RAW JSON field. 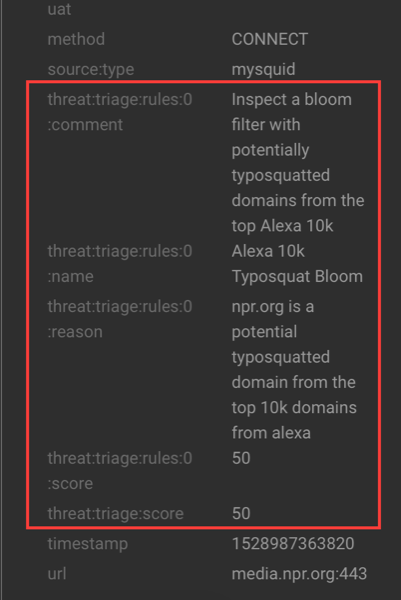 "is_alert := (exists(is_alert) && is_alert) || is_potential_typosquat"
"reason": "FORMAT('%s is a potential typosquatted domain from the top 10k domains from alexa', domain_without_subdomains)"
Click SAVE below the JSON information. Click SAVE at the bottom of the Squid sensor configuration panel. 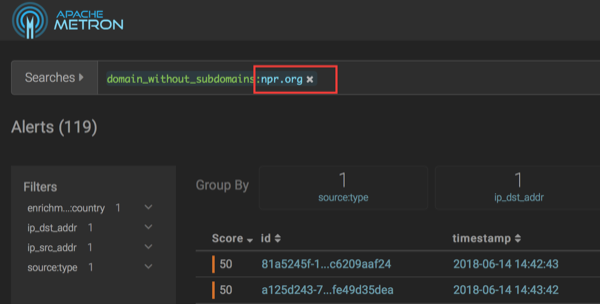 After you identify a potential typosquatted domain, investigate it, and determined that it is legitimate, you can stop future alerts by using a domain whitelist enrichment. In the Management UI, click the pencil icon next to the mysquid sensor. 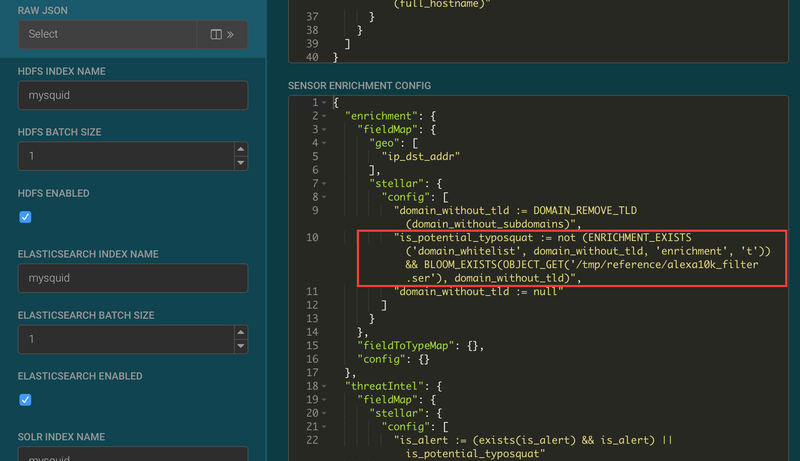 The Management UI displays the sensor configuration form. 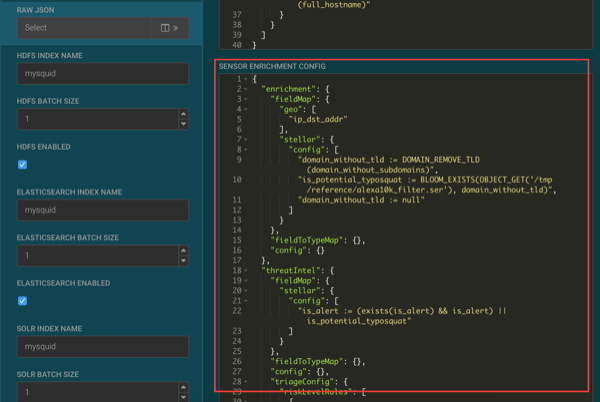 Click (expand window button) next to the RAW JSON field. Ensure that the results appear in the Alerts UI. Enter cnn.com or nsp.com in the browser connected to the HCP proxy. In the Score column, you should see events with non-zero scores and the is_alert field set to true. 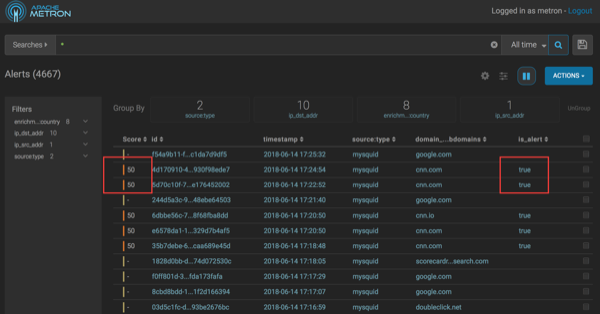 If you want to view the columns as they appear in the screen shot, click the gear icon to the left of the Actions button and unselect all fields except Score, id, timestamp, source:type, domain_withoutsub_domains, and is_alert fields, then click Save. Click the Score header to sort the events ascending by Score. Click again to sort descending by Score. A downward arrow appears next to the Score header when sorted descending by Score. Click between the columns of one of the Scored alerts to view the alert details. The fields beginning with threat:triage:rules show the results of all the triage rules. The threat:triage:score field is the aggregated score of the event. If there is more than one triage rule, this field will contain the score combining the results from all the rules. The is_alert field is set only if the triage rules indicate the event is an alert. To see all the alerts for a particular domain, click the domain name. The Alerts UI displays only the alerts with the selected domain name. To remove a filter, click x next to the filter. To view all events, click x on the Searches field.